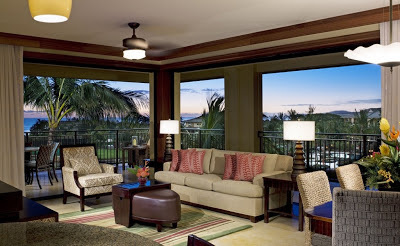 While clearly this room is ‘all about’ the Hawaiian scenery, this cozy living area is simply delish. The patterned chair is gorgeous and attention grabbing, while the solid neutral toned couch pops with the tropical red fern toss pillows. The area rug is spectacular. Notice how the colors of the stripes incorporate all the colors in the room, making it the perfect floor covering for this warm and casual area. Look for textures in the dining chairs and savor the natural colors in the granite counter top. This is truly a space inspired by its glorious Hawaiian location.